The James Webb Space Telescope (JWST), previously known as Next Generation Space Telescope (NGST), is a part of NASA's ongoing Flagship program. It is under construction and scheduled to launch in 2018. The JWST will offer unprecedented resolution and sensitivity from long-wavelength (orange-red) visible light, through near-infrared to the mid-infrared (0.6 to 27 micrometers). 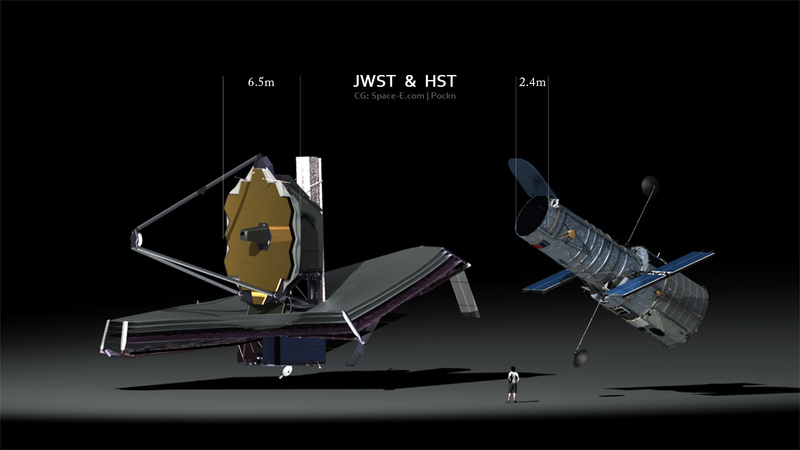 While the Hubble Space Telescope has a 2.4-meter (7.9 ft) mirror, the JWST features a larger and segmented 6.5-meter-diameter (21 ft 4 in) primary mirror and will be located near the Earth–Sun L2 point. 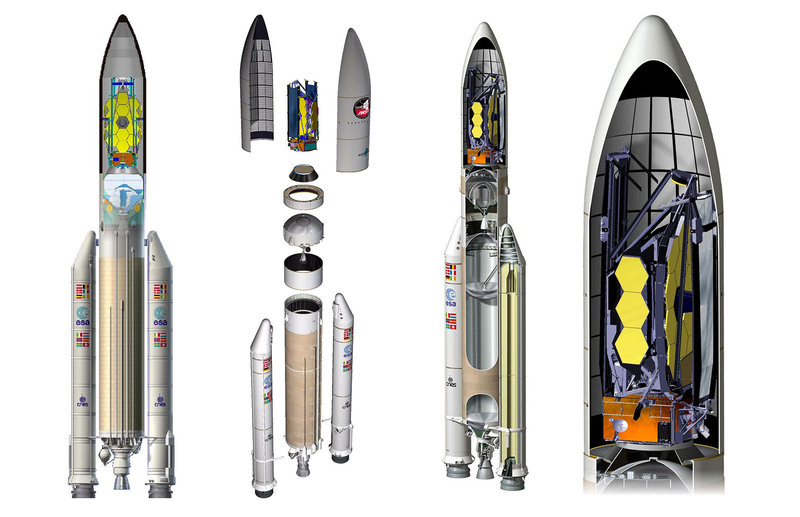 A large sunshield will keep its mirror and four science instruments below 50 K (−220 °C; −370 °F). 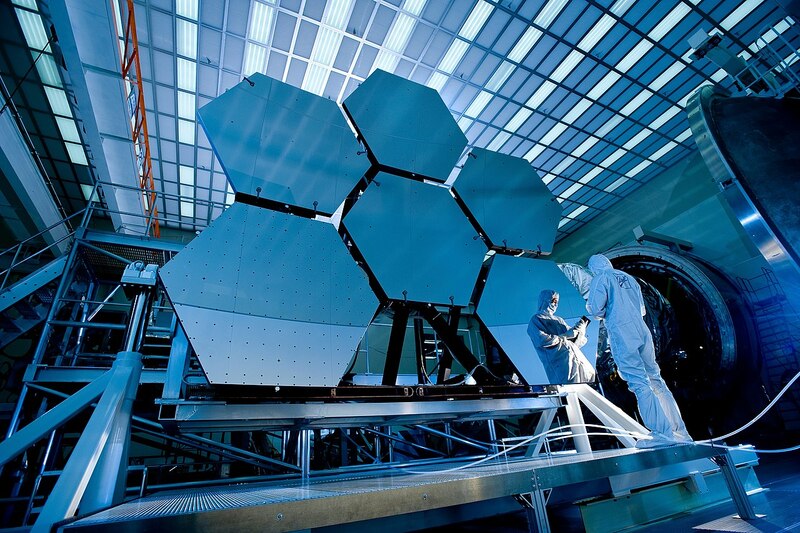 JWST's capabilities will enable a broad range of investigations across the fields of astronomy and cosmology. One particular goal involves observing some of the most distant events and objects in the Universe, such as the formation of the first galaxies. These types of targets are beyond the reach of current ground and space-based instruments. Another goal is understanding the formation of stars and planets. This will include direct imaging of exoplanets. In December 2016, NASA announced that the JWST has passed major milestones, including completion of its primary mirror and integration of science instruments with the payload module, and is undergoing acoustic and extreme vibration testing to simulate launch conditions. Near InfraRed Camera (NIRCam) is an infrared imager which will have a spectral coverage ranging from the edge of the visible (0.6 micrometers) through the near infrared (5 micrometers). NIRCam will also serve as the observatory's wavefront sensor, which is required for wavefront sensing and control. Near InfraRed Spectrograph (NIRSpec) will perform spectroscopy over three observing modes: a low-resolution mode using a prism, an R~1000 multi-object mode and an R~2700 integral field unit or long-slit spectroscopy mode. Switching of the modes is done by operating a wavelength preselection mechanism called the Filter Wheel Assembly, and selecting a corresponding dispersive element (prism or grating) using the Grating Wheel Assembly mechanism. Both mechanisms are based on the successful ISOPHOT wheel mechanisms of the Infrared Space Observatory. The multi-object mode relies on a complex micro-shutter mechanism to allow for simultaneous observations of hundreds of individual objects anywhere in NIRSpec's field of view. Mid-InfraRed Instrument (MIRI) will measure the mid-infrared wavelength range from 5 to 27 micrometers. It contains both a mid-infrared camera and an imaging spectrometer. The temperature of the MIRI must not exceed 6 Kelvin: a helium gas mechanical cooler sited on the warm side of the environmental shield provides this cooling. Fine Guidance Sensor + Near InfraRed Imager and Slitless Spectrograph (FGS/NIRISS) is used to stabilize the line-of-sight of the observatory during science observations. Measurements by the FGS are used both to control the overall orientation of the spacecraft and to drive the fine steering mirror for image stabilization. A Near Infrared Imager and Slitless Spectrograph (NIRISS) module for astronomical imaging and spectroscopy in the 0.8 to 5 micrometer wavelength range will be physically mounted together with the FGS; though often referred to as a single unit, they serve entirely different purposes, with one being a scientific instrument and the other being a part of the observatory's support infrastructure. The James Webb Space Telescope (JWST) Integrated Science Instrument Module (ISIM) and Command and Data Handling (ICDH) engineering team uses SpaceWire to send data between the science instruments and the data-handling equipment. The Telescope will be located near the Second Lagrange point (L2) of the Earth-Sun system, which is 1,500,000 kilometers (930,000 mi) from Earth, directly opposite to the Sun. Normally an object circling the Sun farther out than Earth would take longer than one year to complete its orbit, but near the L2 point the combined gravitational pull of the Earth and the Sun allow a spacecraft to orbit the Sun in the same time period of the Earth. The telescope will circle about the L2 point in a halo orbit, which will be inclined with respect to the ecliptic, have a radius of approximately 800,000 kilometers (500,000 mi), and take about half a year to complete. Since L2 is just an equilibrium point with no gravitational pull, a halo orbit is not an orbit in the usual sense: the spacecraft is actually in orbit around the Sun, and the halo orbit can be thought of as controlled drifting to remain in the vicinity of the L2 point. This requires some station-keeping: around 2–4 m/s per year from the total budget of 150 m/s. Two sets of thrusters constitute the observatory's propulsion system. Separate registration and security screening for non-US citizens. Students can expect to learn the science, physics, mechanics, materials, optics, instruments, instrumentation, vibration testing, acoustic testing, structural calibration and the leading innovations in James Webb Space Telescope; and learn how Science, Technology, Innovation and Leadership unites at one of the best agencies in the world to build and deploy an un-precedented Space-based-Telescope.